I’ve returned from my vacation, and I am so excited, because I returned to ShannonAThompson.com passing 8,000 followers 😀 Thank you for the coming home present. I’m truly blessed to be gifted with so much encouragement, and I’m working hard to get more novels out along with writing and publishing tips. But what am I going to write about today? I wanted to share my vacation with everyone, because I had a wonderful time, and I think it’s a great place to go! I also think it’s important to also think about potential in vacation in regards to writing. Who knows? You may be vacationing in your novel’s next setting. I definitely thought Eureka Springs was an interesting and beautiful place. There is so much to do downtown: art galleries, shows (opera and magic), bars, music, and historical tours, including the Basin Park Hotel. My favorite place for food was Local Flavor, but I enjoyed Eureka Live Underground for drinks. The photo below is the New Delhi Cafe. It was the Blue Grass Festival this week, so there were a lot of bands entertaining the town. Built in 1886, this famous hotel was originally an elite hangout. It later became a women’s college and then a cancer hospital with one of the biggest medical scandals in the U.S. The grounds is beautiful, but it’s been on Ghost Hunters (with some amazing ghost footage) which you can watch here. I actually went on the tour, and it takes you through the historical deaths, ending in a morgue in the basement. 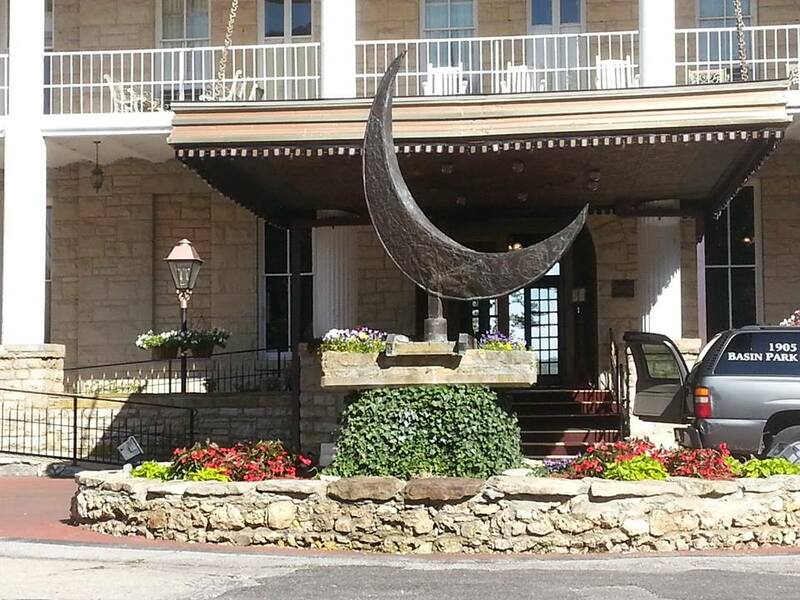 If you’re not into ghosts, The Crescent Hotel also has a gorgeous spa and a patio sky bar. That’s right. 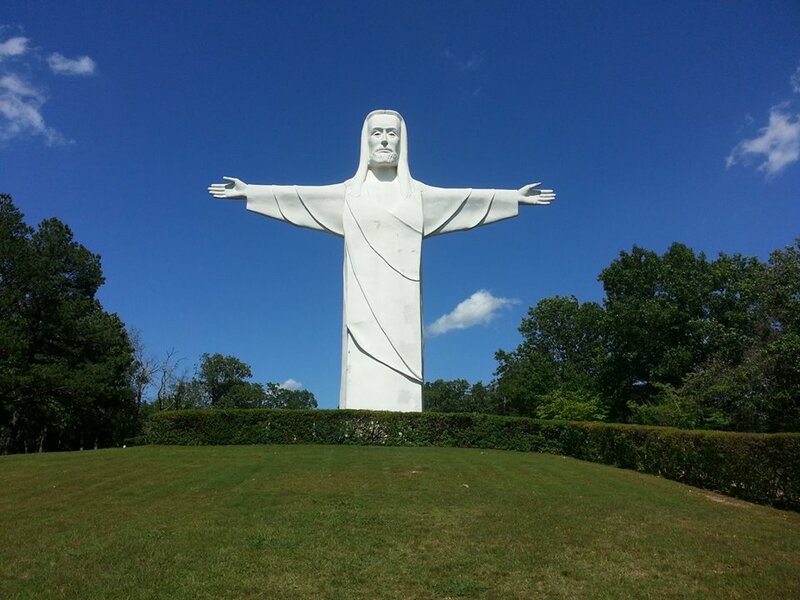 There’a four-story statue sitting 1,500 feet into the air (at 67 feet tall.) It’s a pretty amazing site, and you can see it from the sky bar on the Crescent Hotel. 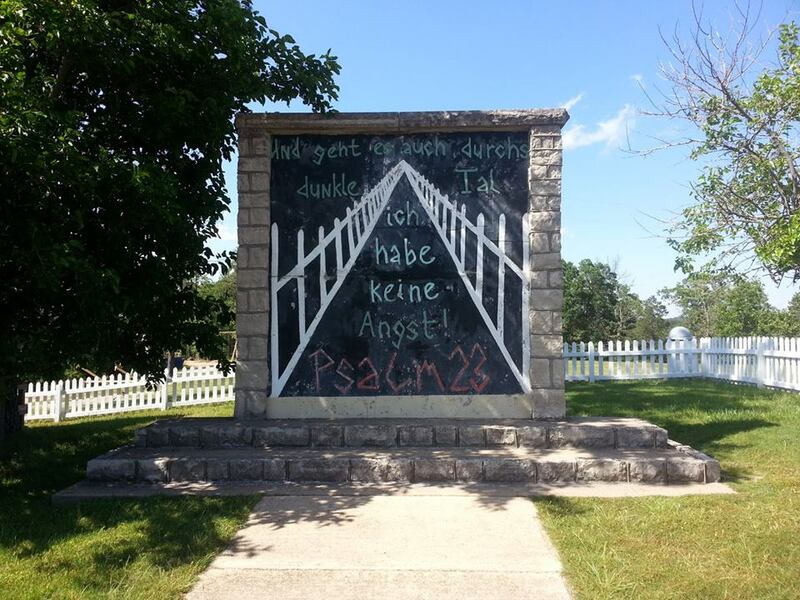 They have a piece of the Berlin Wall right behind Christ of the Ozarks. Definitely worth the stop to see such an amazing piece of history. I did more than this, but I thought these were some of the best places to go! But I also wanted to share something else–a part of the vacationing process I always enjoy. Whenever you go somewhere, consider stopping (or going a little out of the way) to see other location. We stopped at two: Tablerock Lake and Osceola Cheese Factory, and it was worth it! The lake was beautiful and the cheese–yum! 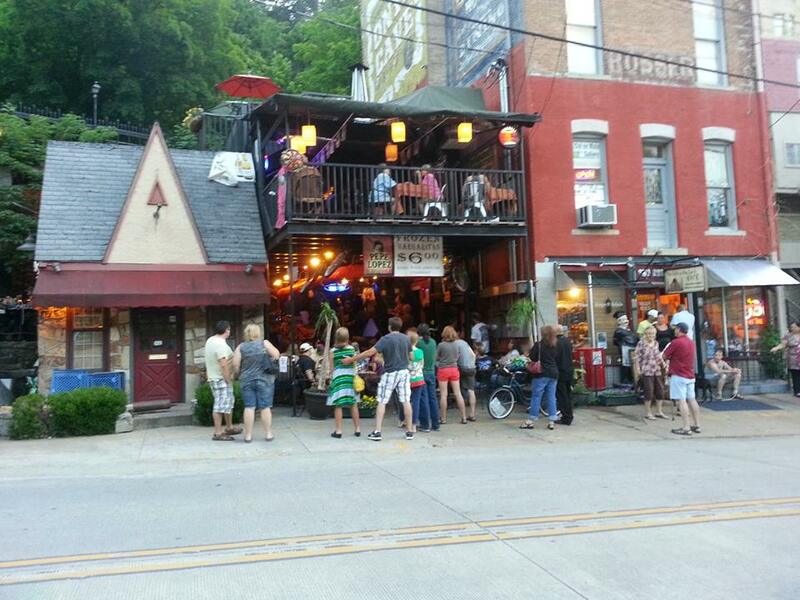 Basically, I had a great time, and I think Eureka Springs is a lovely vacationing spot if you’re thinking about going somewhere. I hope to return (and soon!) In the meantime, I will be in Kansas, organizing some writing and publishing tips for everyone. I’ll continue those posts starting on June 14th, which is the day Minutes Before Sunset becomes available as paperback! You can pre-order it now, but it’ll ship on June 14th, so I’m excited for that change! Amazon is selling the paperback at $10.95 while Barnes & Noble is selling it for $10.86 (for members.) Both are selling the ebook for $7. On February 26, 2013 I wrote Writing Tips: How to Handle Rejection, and I discussed John’s entertaining ability to be honest about rejections from the publishing industry. His website has changed to share anyone’s rejection letters from publishers, so feel free to email him by checking out his website Rejection Love Letters. On April 16, 2013 I was interviewed by author Dan Thompson. (Click here to read it.) And his writing, The Casework Memoirs, will be available for FREE June 14 through June 18 on Amazon. Again, thank you for helping me reach 8,000 followers and celebrating all of these moments with me! I hope everyone’s summer is going great, and I can’t wait for the paperback of Minutes Before Sunset to be released this Friday! Thanks for the tour! I ‘ve never been to that area of the USA, so nice to be your armchair traveling companion! You’re welcome. Glad to have your traveling as a side companion! I used to live within 30 minutes of Eureaka and it is an amazing place! People there are cut from a way cool cloth, it seems. An interesting side note: Eureka Springs does not allow any new houses to be built and if you remodel a house, you have to keep with the original style of the house, adhering to a strict code. I love the ambience and hope to go back soon! I loved the strict code they had about the buildings (a local told us about it over drinks at Eureka Live Underground) because it keeps the old-time feel while also enhancing the atmosphere of the friendly locals. Everyone was unbelievably nice! That’s only a few hours from where I live! I suppose I didn’t think people that weren’t from the area actually vacationed around here. That is a pretty neat place, lots of bed and breakfasts. Yeah! We met quite a few people that were also from out of town, generally from the midwest. 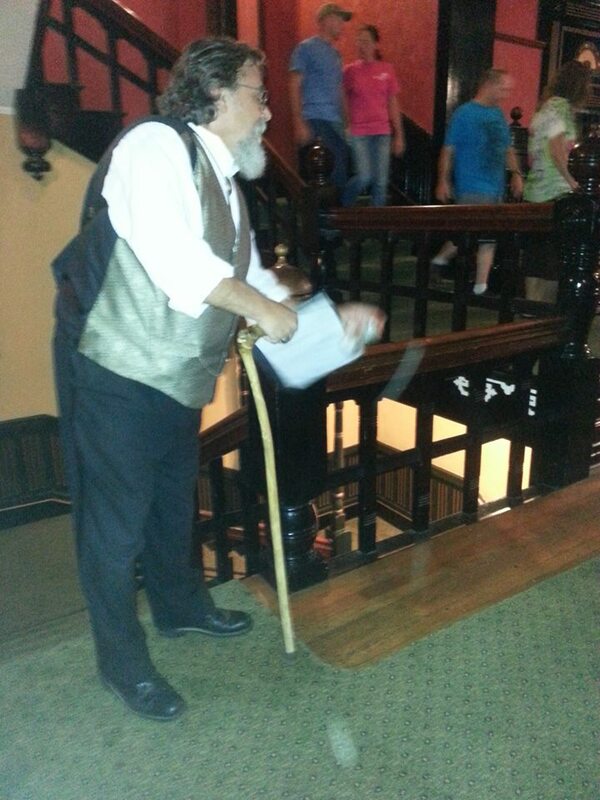 I love ghost tours! That looks like a fun trip. Congrats on the 8,000+ followers. It was my first one, but I’ve always wanted to go on one! It was a lot of fun. And thank you for the congrats. Thank you :] And you’re welcome. Glad you enjoyed the photos. Shannon you missed the best part of all, I am within twenty minutes of Eureka 🙂 Glad you enjoyed your vacation in my neck of the woods. So glad you enjoyed your stay in my city. Looks like you hit some of my favorite places. A few corrections….. The annual bluegrass festival is not until August 15th-17th. There haven’t been any music festivals here yet during the 2013 season. Our first one kicks off tomorrow and it is Blues (the banner is already up, maybe you saw that?). We also have Jazz & Folk festivals coming up this fall. But we just happen to have a LOT of great music playing year round. You didn’t mention it but I REALLY hope you stayed at the Writer’s Colony at Dairy Hollow. It’s THE place to stay as a writer. If not, please google and come back. You missed a treasure! To correct a commenter too….new homes are most definitely allowed to be built in Eureka Springs. Even in the historic district. I can name a handful that are brand new or being built at this moment. There is a Historic District commission and a Planning Commission that oversees and enforces rules because we are on the National Register of Historic Places, but new homes can be built any time. O_O Wow. Thank you for the information. We stayed at the Belladonna. Just a little cottage near downtown. I definitely want to come back, and I’ll check out your Writer’s Colony at Dairy Hollow. I would seriously soil myself if I visited that ghost hotel. Haha. I love anything to do with ghosts. Guilty pleasure. That all looked awesome. A statue of christ and a piece of the berlin wall? Where has this little gem been hiding? Thanks for the tour. right? I had no idea until we got there. Glad you enjoyed it. So did you see any ghosts? Haha. No. But the stories were really neat since the hotel used to be a fake cancer hospital, women’s college, and elite meet up. There was a woman who died by falling, jumping, or getting pushed off the fourth floor balcony. An Irishman who died building the place. A cat! And a morgue in the basement along with a lot of other historical stories. Welcome back! I’ve never been there either! Great photos! Glad you came back refreshed. Thank you! I took a ton of photos. I have 300, but I only printed 100. It was so beautiful. Lots of trees and springs.